You are here: Home / Uncategorized / Marquee Flooring Hire: What Are My Options? 2 What issues typically dictate choice of marquee flooring option? 2.1 Most difficult marquee flooring challenges? 3 What is the usual range of marquee flooring hire options offered? Marquee flooring hire benefits from all kinds of structure, material and dimension. With all of the solutions available to hire companies and their clients, it pays to know a little bit about the various options. Often, choice of marquee flooring is largely dictated by practicality. The application of one flooring solution or another comes down to suitability, given the unique demand of a particular event. As part of the marquee hire site visit, the shortlisted hire contractors will typically assess the proposed event environment for suitability for one type of flooring approach or another. Despite client preference, it may be best for safety purposes that the contractor strongly advise the organiser (or even insist) that a particular type of flooring is installed. What issues typically dictate choice of marquee flooring option? The ground type is the most important factor for deciding marquee flooring. There are other factors also, such as the nature of the event (for black tie events where stiletto heels are expected, organisers and hire contractors must ensure firm/hard flooring - even if beneath carpeting). Most difficult marquee flooring challenges? A major issue to take in consideration when planning marquee flooring hire is: uneven ground. This challenge is generally overcome by using a marquee flooring solution known as cassette flooring. Cassette flooring works by raising up an artificial wooden floor, comprised of individual, interlocking boards upon a solid base of steel structured sub-flooring. To look at it whilst being installed, you'd see the aluminium/steel structure framing as a solid lattice of underpinning beams within which wooden boards are integrated, forming a seamless floor system for the event. platform which holds firm, giving event guests an uninterrupted, flat flooring layout throughout. When installed properly, no one would ever know the difference. A company called Tectonics UK, specialises in the manufacture of such a system. Highly adaptable; where you require a bespoke flooring solution being implemented for your event, Tectonics UK provide just the answer. Tectonics UK's solution claims revolutionary status by combining a cassette flooring system (with interlocking wooden boards on an aluminium frame) with... Floorstak (a piston like levelling/suspension system to place the cassette on). Strong, sturdy and level are the proposed plus points for this combo. Just how strong is cassette flooring? Exterior construction industry grade plywood plus aerospace grade aluminium. Tried and tested. Even without the underlying Floorstak sub-floor system, the cassette flooring is often enough to solve the problem. No ridges, bumps, dips, or trips. How easy is it to handle? For contractors it is made with ease, speed and user-friendliness in mind. It helps them get the job done correctly, first time around. Floorstak sub-floor underpinning for cassette flooring systems comprises of cylindrical support units which accommodate adjustable angles and heights. The baseplate of the flooring simply sits upon the cylinder heads. This system effectively perform the job of scaffolding, but with aplomb. Ever thought about having variable flooring heights within one Clearspan marquee structure? Or a ramp for flooring installation for disabled access? The Tectonics UK's cassette flooring and Floorstak support is your bespoke choice. It is literally tailor-made for the purpose of overcoming such challenges. What is the usual range of marquee flooring hire options offered? ...heavy duty rubber-like tiling which slots into place and simply locks together to make a seamless, multi-purpose event flooring. easily installed and great even for enduring vehicle wheels etc. ...reinforcement meshing is a great grass saver and a simple outdoor flooring solution for an informal home-based gathering or event. ...a quick & inexpensive option for marquee flooring. A go-to option for many of small scale marquee hire companies serving local clients on a tight budget. ...for a more formal event, marquee carpeting can be just the solution for adding that touch of class. Usually installed either directly onto the surface, or as an overlay above waterproof event flooring. ...whether installed on grass, concrete, rubber playground surfacing - a Clearspan marquee need not come with additional flooring if you think it would be appropriate for your guests can go without. great for mid-summer outdoor events which are likely to be dry. A mammoth task for even the most experience of marquee flooring hire contractor. Large Clearspan structures with bespoke wooden flooring are like a jumbo jigsaw puzzle of sorts for the crew, but with enough hands on deck and a little expert joinery help (...or a lot if you can get it) there won't be a wobble in sight. Finishing touches such as putting in the screws to firmly position any particularly needy boards, keeps your wooden event flooring without any defects. Options thereafter can be to leave it as it is, or to overlay with carpet - your choice! For marquee events where particularly high traffic footfall is expected, and the nature of the event is more rough and ready than let's say a wedding or tea party for example, then a more enduring flooring solution is required. Heavy duty rubber flooring is able to hold up even under the tyres of vehicles such as cars, forklift trucks etc. For outdoor motor vehicular rallies perhaps or similar kinds of events this is just the ideal solution. This kind of grid matting solution is really dual purpose: for preserving the grass surface from itself becoming matted and even muddy under the testing for feet or even tyres; and secondarily, prevention of accidents from a trodden down and boggy grassy surface. Easy to lay down, non-shifting, high traction grip - a great general purpose outdoor event flooring, even for makeshift car parking on the grass. Roll down, roll up convenience and of course, re-usable. A quick win if in doubt for a durable marquee hire flooring fix. With the appropriate anchorage in the relevant places (well considered nails will often do) coconut matting should remain in the arrangement set. It is prone to puckering and inviting trip hazards, so diligence to set it right with maximum stretch will keep you event running without hitch. 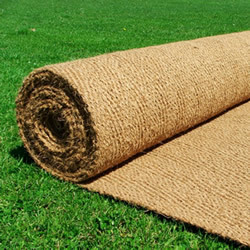 Heavy set, it can be laid directly on top of grass surface if required. Quick & cost effective, this is a favourite for many local marquee hire contractors for informal parties and gatherings - especially if the guests are expected to be children, which usually just lowers the the budget expectations. The following is a marquee flooring hire contractor who transparently shares their pricing online. Are you looking to get some marquee flooring hire prices for you local area?